The people generally get accustomed to the established order of things and begin to tremble at the very idea of a change. It is this lethargic spirit that needs be replaced by the revolutionary spirit. - Bhagat Singh. 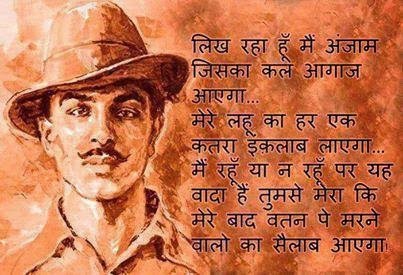 Paying humble tributes to Bhagat Singh on his birth anniversary on 28-Sep.
भगत सिंह को उनके जन्मदिवस पर शत शत नमन!